"With each of his Hector Lassiter novels, Craig McDonald has stretched his canvas wider and unfurled tales of increasingly greater resonance." "Reading a Hector Lassiter novel is like having a great uncle pull you aside, pour you a tumbler of rye, and tell you a story about how the 20th century 'really' went down." "James Ellroy + Kerouac + Coen brothers + Tarantino = Craig McDonald." Nazis, black magic and secret history collide in The Great Pretender. 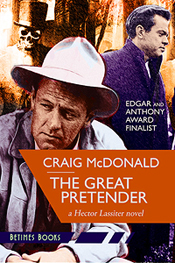 In 2007, McDonald launched the Hector Lassiter series with the Edgar® Award-nominated debut, Head Games, pairing the globetrotting, larger-than-life crime novelist with equally legendary filmmaker and amateur magician Orson Welles. "The Great Pretender" fits the capstone on the Lassiter/Welles legend, spanning their decades-long, uneasy association from the run-up to Welles' infamous "War of the Worlds Panic Broadcast of 1938" to the set of the noir classic "The Third Man" and the ruins of post-war Vienna. The novel finds the actor and author in a race for a lost holy relic promising its possessor infinite power but a ghastly death if lost. Hector and Orson's competitors in their quest for the 'Spear of Destiny' or 'Holy Lance' include German occultists, members of the Third Reich, a sensuous Creole Voodoo priestess and a strangely obsessed J. Edgar Hoover. "I've been a fan of McDonald's sprawling, wildly ambitious series about Hector Lassiter, the two-fisted novelist who trucks with twentieth century luminaries, from the outset. Pretender finds Hector in pursuit of the Spear of Destiny, last seen in Hellboy and Constantine, and tangling with Nazis, witches and, most contentious of all, Orson Welles. McDonald cagily splits up the action, with Welles in full enfant terrible mode in the first half of the book—much of the story unfolds on the night of the infamous War of the Worlds broadcast in 1938—while the second takes place in the late 1940s as the filmmaker's star is already burning out. Another entire Lassiter novel, Roll the Credits, slots in between, and I'll be tackling that one soon enough."